Ok, so it looks pretty — but what's new? You may have seen our recent announcement of the Stack Overflow salary and skills calculator, developed as a part of our endeavor to improve the hiring process for devs, and with the objective of empowering job seekers with as much information as possible. To get you closer to the goal of having as much transparency as possible with regards to compensation when looking for the right job, you'll also be able to sort your search results by salary. We've also ajaxified the page, making search considerably faster. 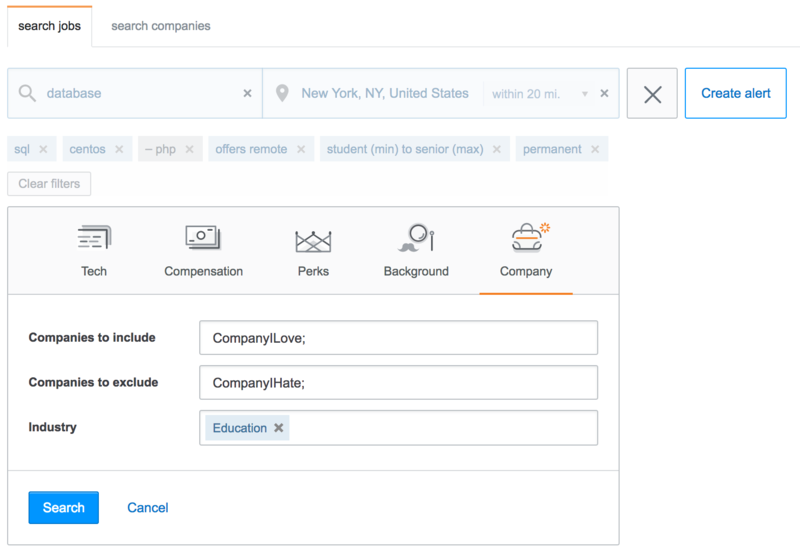 Once the filters panel is open, you'll be able to filter your search results by tech, compensation, perks, background, and company. That means hiding all jobs from a specific company (maybe because you've worked there already) will be possible in a pretty straightforward way, as will specifying which companies or industries you'd like to work in. The new job search will roll out to half of the community today, and to everyone later this week. 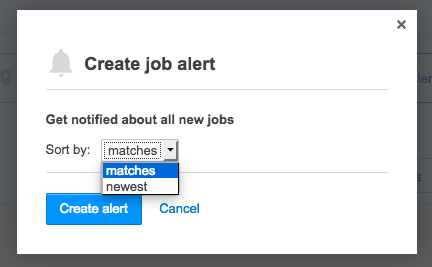 We conducted several rounds of user tests as we built our new and improved job search, but as always, we may have missed something. So if you happen to stumble upon any bugs once the new search is enabled for you, please report them either by posting them as an answer to this question or by posting questions with the tags bug, jobs and search. I'm not sure if an answer is the best place to put this, but: I wish we could specify a shorter distance than 20 miles. Or maybe even a directional offset. 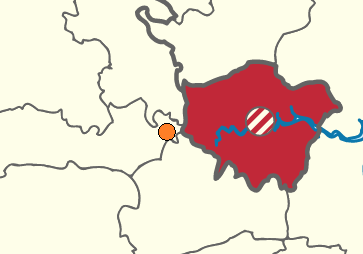 The striped area is Central London; the big red area around it is Greater London; and the orange circle is roughly where I live. I'm not all that interested in commuting anywhere into that big red area. I am however interested in commuting to the north, south and west of where I live. Allow us to specify shorter distances. Allow us to sort the resultset by distance (at least this way I'd get the results closer to home before getting all the Central London ones). Allow us to offset the direction (e.g. 20 miles to the west (although admittedly this sounded a lot more awesome in my head, now it just sounds a little stupid)). That said, the UK property website RightMove has a nifty draw a search feature which allows you to draw on a map to pinpoint exactly where you'd like to live. Something like this would make my life a lot easier. When I want to edit the match process, the "Tech you want to work with" only list the technologies of the filtered list of jobs (for instance those in X location). Shouldn't it be general? I mean showing all the technologies I like, even if in this specific search there aren't jobs with technology Y? Also I have selected two industries for my match, however almost all I see are other type of industries. How is the industry taken into account? I suppose it could be due to lack of information provided by companies... but I found an interesting company which list the industry as "Bioinformatics, Biotechnology, Computer Software" which is not listed as tag for my match criteria. How are those included in the match engine? For the Company section, I propose that for Industry, there is an input for excluding industries. 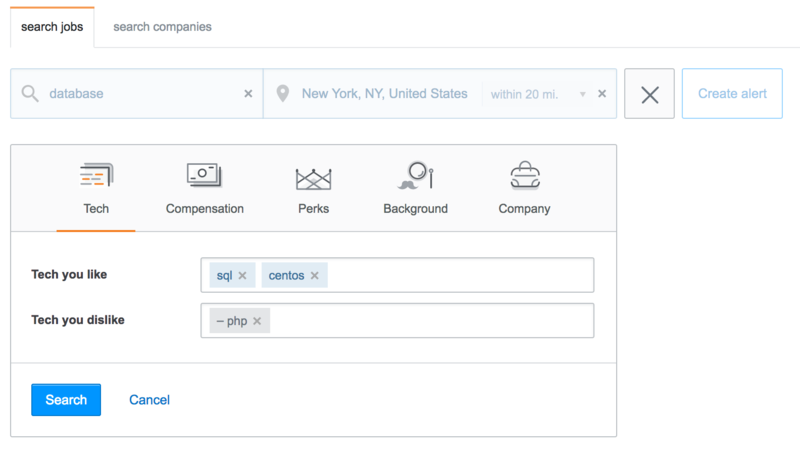 In the perks section, you can specify that you want to include companies that offer remote work. Without playing around with the search results, it isn't clear if checking that setting means "show me only remote jobs" or "show me jobs that are either remote or near the specified location" (and similarly, what it means to have it un-checked). It would be really nice to be able to filter on various company attributes, most notably company size. Not the answer you're looking for? 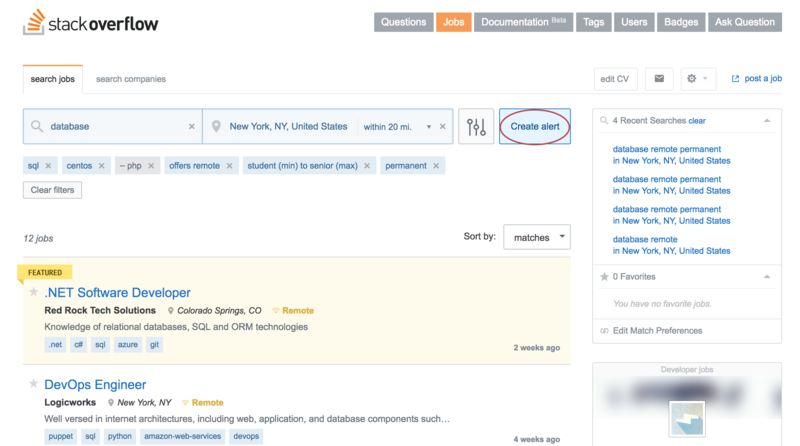 Browse other questions tagged discussion jobs search .